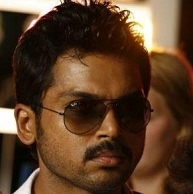 Will Karthi repeat the success in Telugu? Karthi had rendered his voice for the raunchy yet enjoyable item number in Venkat Prabhu's Biriyani, Mississippi, also featuring the vocals of Priya Himesh and Premgi Amaren. This Yuvan composition has already been making waves in the online and FM space. Now, Karthi is set to repeat his vocal performance for the Telugu version of the number as well, thereby marking the first time that he would be singing in Telugu. The team would be hoping that the success story repeats in Andhra too. People looking for online information on Biriyani, Karthi, Mississippi, Yuvan Shankar Raja will find this news story useful.